Goldfinch and I differ in one key respect: POPCORN! The night we met…you see I had popcorn…sweet popcorn. He said later that was the only thing I did wrong that night! He insists popcorn should be salty. Last time we went to the cinema together, I shared a huge tub of salty popcorn with him – because I love him. However, in my mind popcorn should be sweet. 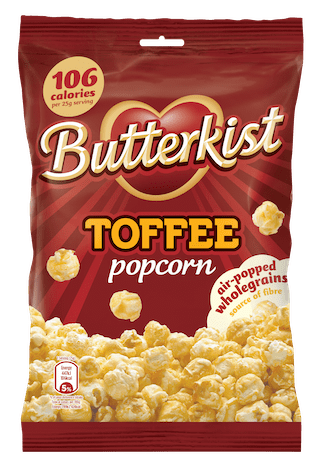 I have grown up loving Butterkist Toffee popcorn. So sweet toffee popcorn is absolute popcorn perfection to me. I don’t want to take too much of your time, I am sure you are very busy writing your own posts, but would you kindly send a quick comment saying SWEET or SALTY and then later I can count them up and show Goldfinch the international response to this question. If you have the time…ask all the members of your family or household…ask your workmates. The more who are willing to offer a vote, the fairer a trial it will seem to Goldfinch. I am sure it is not going to change his preferences…but I am hoping that if I receive enough support, he won’t think my liking sweet popcorn is quite so strange! In the meantime…here are some other rather unusual flavours of popcorn that Joe & Seph’s actually make and presumably people buy them (I can only imagine pregnant women with cravings would enjoy them) but then everyone is different! I am going to be very controversial. I detest the taste and smell of ALL popcorn. It prevents me from enjoying going to the cinema because now people would rather stuff their faces than watch a film. I am not sure what Goldfinch will say to that! My sister brought a big bag of sweet and salty popcorn and she said I can share it with Goldfinch next time I see him. But I have a feeling Goldfinch won’t want it…he thinks it should always be salty and sweet is odd. I am hoping to show him that there are a lot of people out there that like sweet popcorn. What about you Santosh…which do you honestly prefer? It’s ok, I won’t be offended if you prefer salty! Thank you Santosh…it’s funny I thought salty popcorn was a new thing! Both!! I LOVE popcorn in general!! For me, popcorn is something I try to avoid, because once I start, I cannot stop! Same!! There’s a bar down the street from my husband’s uncle, & it’s seasoned with rosemary, I have to get some every time go! Really, oooh, that sounds quite nice, I love rosemary. Thanks Paula…I am surprised so many neithers. Do you not like popcorn at all, or do you prefer it plain? Occasionally I enjoy the salty kind, but then it gets all in my teeth and makes me unbearably thirsty… so I remember why I avoid it! That’s what I found when I shared the salted popcorn with Goldfinch in the cinema, I drank an enormous amount and then was wriggling around in my seat because I needed to go to the ladies, but I didn’t want to miss the end of the film. It is sweet popcorn. Not as sweet as caramel popcorn. Sweet all the way!!! Although, I have got quite a taste for the sweet and salty popcorn you can buy now – I have even asked for half and half of each when I’ve gone to the cinema!! One thing is certain, I can’t go to the cinema and NOT have popcorn, it’s all part of the experience! I am with you there – cinema is not the same without popcorn! Yeh – at least one person besides me likes sweet! I would eat all of those. Yum! Have you ever had Chicago mix style popcorn? It’s caramel and cheddar. It’s amazing. Most grocery stores have it here in the states. I do also love some very salty, fake buttery movie theater popcorn too. Would you really!!! Even the blue cheese and rhubarb? I love caramel…and I can’t imagine mixing it with cheddar…but if I ever get the chance I promise you I will try it! You are brave! I do love blue cheese…but I have never had it with anything sweet. I am going to have to experiment. He will love that! Salty is for sweaty people!!! No offence to the seven bloggers who already voted for salty! No to all those unusual popcorn flavours. Sweet will always be the only popcorn option! I’m not a big salty popcorn person. A little bit of butter on air popped. Caramel popcorn brings up memories of going to festivals in the city and my Dad would give me money to buy a bag for us to share. I like salty over sweet, but, alas, due to a propensity toward diverticulitis, my doctor has recommended that I avoid eating nuts, seeds, and, yes, popcorn! For my hubby it’s salty, but I’m good with both. Unfortunately we don’t get the toffee one here in South Africa, because I am sure that I’d love that seeing as I am in for anything toffee. As for the other flavours you showed – yuck. Any flavor WITHOUT THOSE HORRID KERNELS THAT GET STUCK IN YOUR TEETH. If someone comes up with that sort of popcorn, they’ll have a customer in me….for LIFE. Actually I like a nice even mixture of the two…sweet and savory. Here (across the pond), there’s several options, most contain peanuts for that savory kick in the midst of caramel popcorn. But sometimes (and it’s more in keeping with my diabetic ‘diet’) the lightly (very lightly) salted and buttery kind is best. We totally agree about those kernels. My little niece loves popcorn but we have to make sure each piece is safe for her because she can choke on the kernels. I am sure Goldfinch feels he has won the battle over popcorn! But he is so gorgeous I am happy for him! Weeelll…not really maybe. My personal favorite is kettle corn (or korn..oy vey) … the slightly sweet popcorn. Sometimes I add salt to that.